This type of spring was invented in 1900 by James Marshall. Unlike other types of springs (continuous coil or bonnel type), they are springs in the shape of a barrel that are individually wrapped in fabric. The heart of dapt-Tech is a bed base of independent springs of tempered steel, pocketed individually. The Adapt-tech technology contributes to our rest with three significant benefits: further adaptability, stability and ventilation. 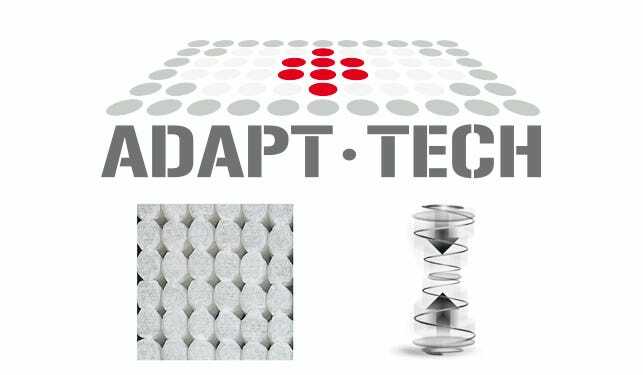 The structure of Adapt-tech springs responds to different weights and shapes dynamically and independently. Adapt-tech also avoids the transmission of body movements to the other part of the bed. Finally, the pocket's internal fabric allows the inner circulation of the air in the core. Pikolin offers the exclusive pocket spring technology called Adapt-tech. The heart of Adapt-Tech is a block of independent hardened steel springs that are arranged in individual pockets. It provides an individualised response to body movements while resting, adapting to the weight and build of each person.